As part of the probate process, a personal representative's duties include transferring a decedent's real property to those entitled to receive it. A personal representative may also sell real property in order to pay the estate's debts. An executor is a personal representative designated by a decedent's will to settle the decedent's estate. Use an executor's deed to convey fee simple title to a grantee, who is either a beneficiary, heir, or buyer. The deed contains covenants that the grantor is qualified to act as executor of the decedent's estate; is authorized to bargain and sell the property pursuant to the terms of the decedent's will or by order of the probate court; and will warrant and defend the grantee's title against the claims of persons by, from, or under the grantor. 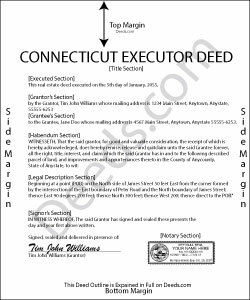 Contact an attorney with questions about executor's deeds or any other issue related to probate in Connecticut. Bobbi W. said: Site was super easy to use. After frustrating search for the item I needed I found it here!